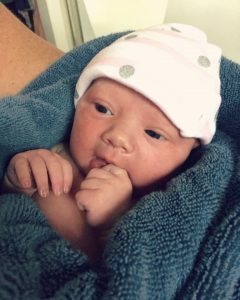 Our beautiful Kate Isabelle was born in the comfort of our own home on August 13th. The journey of her existence was one of surprise, personal growth, excitement and great anticipation. Kate is my fifth baby and this would be my third time using the Hypnobabies Home Study. I had randomly come across hypnosis for birth during the last trimester of my third pregnancy. I had never even heard of such a thing and I didn’t know anything about natural childbirth. But as I became more and more educated, I knew in my own mind that if other women were doing it by choice and with ease, I most certainly could as well. So, I dove in at 32 weeks and finished the study just in time to bring my son into the world at 37 weeks. It was incredible, and more than I’d ever hoped for. Having had an unsatisfying epidural with my first birth and an unnecessary lengthy pushing time with my second baby versus this new, natural experience, I knew that Hypnobabies would be my strategy with all future births, hands down! Fast forward to baby #5… due to some stressful life circumstances, I was experiencing quite a bit of anxiety this time around. I knew I needed to get my mind in the right place and begin to focus on my sweet baby and her birth. So, at about 28 weeks, I pulled my Hypnobabies material out of a dusty box and began to recall my last two Hypnobabies hospital births. Both were perfectly wonderful memories. Things had gone very well each time… but it’s simply my nature to push the envelope even further. I wanted to iron out any wrinkles that I could… How could I make THIS birth be my most amazing experience yet? At about 30 weeks, my husband and I decided that the best decision was to drop the hospital from the equation. So, I transferred my care from my OB to a wonderful, highly-experienced home birth midwife. The care I received with her was starkly different from the very beginning. She’d spend hours with me, getting to know me—my body, my thought processes, my fears. So far, this was already a thousand times better! The days leading up to Kate’s birthing day were interesting. I was experiencing a ton of anxiety at night, wondering how this was going to take place at home. We have four other children and my in-laws living with us, so I was concerned about waking people if it was to happen in the middle of the night. Which room would I birth in? Where would I be comfortable? Would I feel free to be vocal? I spent many nights considering what I would do if my baby came quickly in the middle of the night… I would relax in bed next to my husband with my Hypnobabies hypnosis tracks playing quietly throughout all of my early birthing time, and when it was time, I would kneel down next to my bed and birth her on my knees, where my husband would catch her and wrap her in a warm towel. This visualization would ease my worry each night. Even so, I desperately wanted to have her in the morning after the sun came up. The week before she was born, I began to experience what they call “prodromal labor” —birthing waves that would last for hours, but then stop. They were not like Braxton hicks—they were more intense and would often wake me from sleep. Continuously wondering if the time had come and getting excited, only to be put on hold again was making me impatient. I kept reminding myself that my body was simply preparing and “babies come when they are ready…” I continued drinking Red Raspberry leaf tea and eating dates each day in hopes of having a strong, powerful uterus. In the wee hours of Monday morning, I awoke to an intense pressure wave at 2:30 am. I was able to fall asleep pretty quickly as this had been going on for several days. I awoke to another at 3:30 am, and another at 4:30 am… 5:30 am… By 6:30 am, they were pretty powerful. But an hour in between and lasting only 15 seconds?! I was so confused and a bit annoyed. I decided to get up and take a shower to see if they would stop again… but on my way up the stairs, I began having them back to back—still only 10-15 seconds long. Just before I got in the shower (about 7:45 am), I had a feeling this was it, so I asked my husband to call the midwife and tell her to come. The shower felt so good. I had to lean against the wall during each wave and use my finger-drop technique (Hypnobabies comfort cue) to remain in hypnosis, but I couldn’t help but smile, laugh and cry in between. I was just so happy. My heart was melted in a puddle already and she wasn’t even here yet! I didn’t want to, but I decided to get out of the shower to greet the midwife when she arrived. My waves were too powerful to walk or talk through at this point, so I remained in Center Switch (Hypnobabies technique) in between each wave as I hurried around the house getting some fresh water, a bowl of grapes handy, and brushing my hair before getting comfortable. My midwife arrived at about 8:20 am from another birth and quickly changed her clothes and began getting her things ready. My husband sent my kids off with my in-laws and began filling the birthing tub, which I was excited to try. I wasn’t sure where to go in the meantime and I knew I needed to get more comfortable and begin listening to my hypnosis tracks before entering transformation (Hypnobabies word for transition)… (little did I know, I was already in transformation!) I raced around the house to decide on a good spot. The waves were good and strong, powerfully pushing her down. The concept of pain never even crossed my mind… my body was doing an amazing thing and I was just along for the ride, taking it wave by wave. I began pushing and my midwife appeared by my side as well. I welcomed the stretching sensations as my body pushed her head out. Another push and she came right out into my husband’s arms. She was plump and pink, crying immediately! The midwife provided a warm towel to wrap her in and my husband helped me up onto the bed where we laid together for hours. It was absolutely incredible. So calm, so fast, so enjoyable. Truly, this was my most amazing birth experience yet! Kate was born at 9:18 am, making my active birthing time less than three hours long. She weighed 7 pounds, 5 ounces. Throughout all my birthing journeys, I can’t tell you enough how important it is to focus on what you DO want to happen, and not what you don’t want. The mind is so powerful. Prayer is so powerful. And Hypnobabies really truly is the best tool you could have in your pocket for this most amazing event in your life. I can assure you friends… if I can do it, you can do it, too.